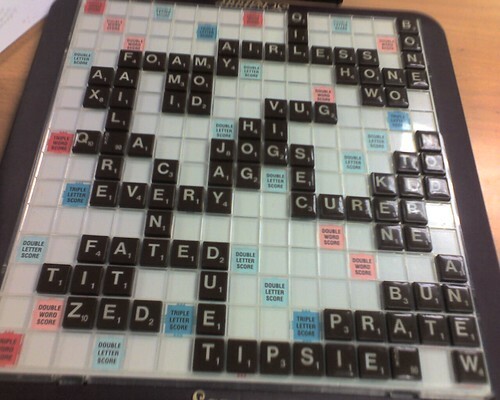 But I have been playing a veritable crapload of Scrabble. These days I'm usually out in some diner or coffeehouse with the Scrabble crew playing mini tournaments or at weekly Scrabble club playing the regular tournament. I'm even playing the most Scrabulous on facebook that I've played since my last operation recovery. 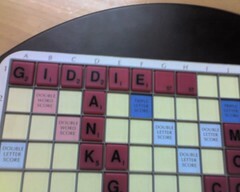 It's all Scrabble all the time. Unfortunately, the last time I studied was the SOWPODS twos and threes in Australia, which means 1) I'm not really learning new OWL words, besides remembering the stuff that gets played on me: paniers...WTF? So I've kind of plateaued. AND I still remember all the SOWPODS crap and I've come so close to playing SOWPODS twos...oh why is OO not an OWL word? WHY? In her defense, I did draw all four esses and both blanks. But in my defense, man did I use them! Failure was my proudest find...it's hard finding a place for a bingo with no ess...and yet I managed it. And come on Failure? With a blank? Who sees that? Me. That's who! Though embarrassing moment of the night was opening up a triple line and getting bingoed on with both blanks...he claims the play was worth 103 points...I didn't say anything because I was too in shock, but I think he screwed me. I think HE got screwed. It was 9*9+50=131.